The strangeness started early Friday when the second batter of the game was awarded a three-ball walk. It continued in the fifth inning when a bizarre mental lapse by Boulder City’s baseball team allowed the tying run to reach second base. None of it fazed Tanner Howell. The senior pitcher danced around trouble for most of the day and finished with a four-hitter, lifting the host Eagles to a 5-1 victory over Chaparral in a Division I-A game. Trailing 3-1, the Cowboys (18-6, 6-3 Sunrise League) threatened in the fifth inning against Howell, putting runners on first and second with one out. Howell struck out Chaparral’s No. 3 hitter, but he and senior catcher Bill Barth headed off the field thinking it was the third out, allowing two Cowboys’ runners to move into scoring position. 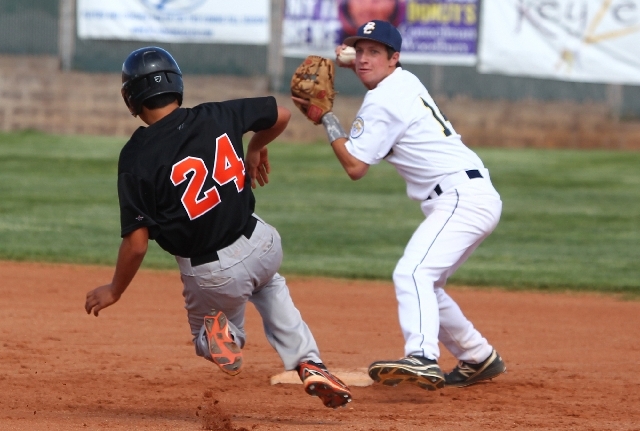 However, Howell got the Cowboys to ground out to freshman shortstop Austin Wishard to end the threat. Howell, a Dixie State signee, threw 122 pitches (76 strikes) and finished with 11 strikeouts and three walks. He fanned the side in the fourth, sixth and seventh innings. Chaparral, which scored its lone run in the second thanks to one of four errors by the Eagles (16-6, 9-0), also threatened in the third until a botched double steal ended the inning. The Eagles took the lead for good in the third when Howell’s single got through Chaparral’s left fielder, allowing junior Colton Bosnos to score from first. Barth followed with a single that scored Howell from third and gave Boulder City a 3-1 advantage. Wishard added a two-run single in the sixth. Boulder City has a two-game lead on second-place Moapa Valley (12-7, 7-2). The Pirates are in town today at 3:30 p.m. An Eagles victory today will give the team the regular season Sunrise title. On Tuesday, senior Corbett Fleming went 2-for-4 with three RBIs to lead the Eagles at Desert Pines, 9-4. Senior D.J. Koopman pitched all seven innings in the win against the Jaguars (6-15, 2-8). Last Thursday, Fleming went 4-for-4 with three runs as the Eagles rallied for a 9-8 nonleague win at Del Sol (5-15), which committed six errors. Howell went 2-for-3 with two runs and two RBIs, and freshman Peyton Koopman drove in three. Wishard added a double. The Eagles host Foothill (17-8) in a nonleague game Friday at 7 p.m. The team’s last regular season home game is Monday against Southeast Career Technical Academy (10-6, 5-4). Boulder City finishes its regular season Wednesday at Sunrise Mountain (6-12, 3-6). If the team wins the league, the Eagles will host a first-round 1-A Southern Region playoff game May 6 at 3:30 p.m.
Review editor Arnold M. Knightly contributed to this report.